From its beginning, Spelman College has encouraged women to engage with their communities through service. On Monday, Jan. 21, join the Spelman community in a day of service in honor of the life and legacy of Martin Luther King Jr. Volunteers have several opportunities to serve, lead and empower the community -- it's the Spelman way! Volunteers will assist in the following: Delineating and marking trails inside; Cutting vines, cleaning and moss removal near fences and gate; Removing invasive species; Sustaining upkeep of “Grandfather Beech”; Hartnett Community Garden Clean-up and OAC Community Aid Clean-up Service. Most activities will take place outside. Volunteers should dress warmly and in clothes that they do not mind getting dirty. Volunteers will assist in various activities to support general farm maintenance and beautification( mulching, planting, painting, etc.). Most activities will take place outside. Volunteers should dress warmly and in clothes that they do not mind getting dirty. Meal Packing – Volunteers will assist with morning culinary preparation and meal packing by separating portioned food in containers and snack bags on a packing assembly line. Volunteers must adhere to dress code requirements: no open-toed shoes, no facial piercings, no gum or drinks, no jewelry including: rings, earrings, bracelets or watches. Volunteers will help sort and package books and other reading materials for shipment to the continent of Africa. This activity will take place in a warehouse and volunteers should dress warmly. Literacy Kits– Volunteers will assist in decorating and putting together Literacy kits for elementary school students in the Washington High School Cluster located in the West End of Atlanta. Join artist Charmaine Minniefield in completing a mural highlighting black history and civil rights. Volunteers will paint segments of the mural and should wear clothes and shoes that they do not mind getting paint on. Spelman College is committed to strengthening the pathway to higher education for students attending schools in the Washington High School Cluster of Atlanta Public Schools. Each fall, we host the Annual Spelman College Girls Leadership Institute, a signature event designed to achieve this important goal. 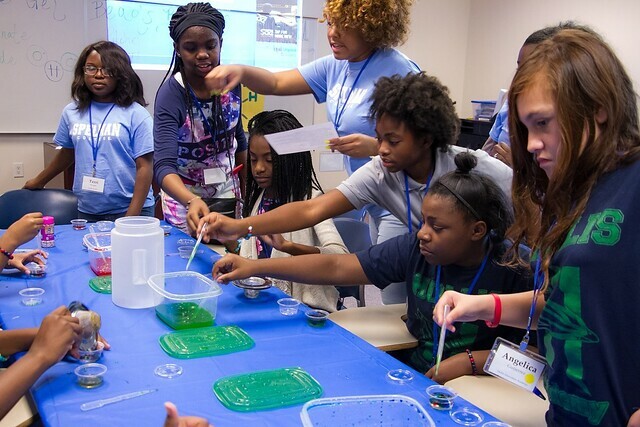 Sponsored by the U.S. Dept of Energy and the Bonner Office of Civic Engagement at Spelman College, the Girls Leadership Institute is a day-long program designed to give middle school girls (ranging in age from 10-14 years old) hands on experiences with STEM workshops that are fun and educational. At the same time, we offer them an overview of Leadership at Spelman College and the chance to identify their own leadership qualities through fun and engaging activities. Our hope is that at the end of the day, girls who started the day confident in their leadership abilities and excited about STEM, will leave with additional resources in their leadership toolkit and an enhanced understanding of how they can connect to opportunities that exists within the STEM field. But that's not all. We also want to stimulate curiosity about STEM in the students who may have started the day with no previous connection to STEM and no vision of themselves as leaders -- we want every girl to leave Spelman's campus each year knowing that she has already begun her leadership journey and that there are a wide array of STEM careers -- one of which may fit into her future plans.